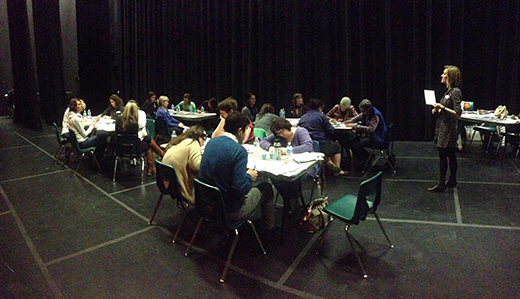 Last week, ArtStarts staff facilitated two different professional development offerings in the Columbia Basin region. Thanks to support from Columbia Basin Trust, and BC Arts Council and the Government of British Columbia's Creative Futures program, we were able to present these events in both Nelson and Revelstoke. You can read more about the event in Nelson here. The Revelstoke event was held at the Revelstoke Performing Arts Centre, attached to Revelstoke Secondary School. 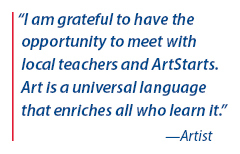 Educators from several different schools in SD19 came together to hear talks from local artists, make connections and learn about ArtStarts' programs. We started off the day with some fun ice breakers and then launched into our artist talks. Local artists Barbara Maye and Tina Lindegaard spoke about their practice and experience with the Artists in the Classroom grant program. This led us into an in-depth discussion about arts-infused learning. After this we rolled up our sleeves and got a little messy with a hands-on activity co-facilitated by artists and ArtStarts staff. After lunch we wrapped up our day by talking about the details of the Artists in the Classroom grant and examining some successful residency projects. After a full day of learning, playing and working, participants left with new ideas of residency projects, lots of resources for help on funding applications and some simple activities to try with their students.